Now here’s another of those little snippets I’ve never noticed before. I’m not entirely sure what the phrase ‘reaching the place of judgement ahead of them’ means, but I love the imagery of other sins ‘trailing behind’ you. Ditto with the positive side about good deeds. I’m picturing the empty cans, streamers and balloons people attach to the back of wedding cars (though the cans are very noisy and I think the imagery here is of something less obvious) – from the front it just looks like a normal car; it’s only when you get to the back that you see the clear proclamation ‘Just Married’. It’s challenging and comforting to know that God sees everything and that one day everything will come to light and be seen and judged for what it is. Whether we’ve been sinned against, or we’ve lived well with little recognition, one day, all will be seen and justice will be served. 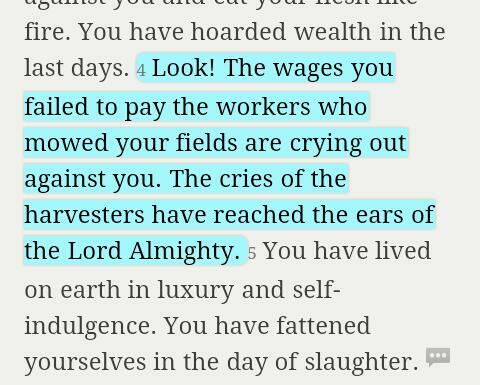 I was happily skimming past this verse this morning when God stopped me. I don’t pay anyone’s wages, and certainly not those of any farmers, I was thinking subconsciously, but God reminded me that, indirectly, I do. Some of you will know that I’ve been thinking a bit about the clothing industry since some friends of mine were so convicted by the conditions of workers in the clothing factories of Bangladesh that they gave away all their clothes and committed themselves to only wearing things they knew had been produced fairly (you can read more here). I haven’t been that extreme, but I have given them some seed funding for their new company, Visible Clothing, and have been giving more thought to where I buy clothes from, to make sure that I’m not contributing to oppression of workers through my own greed (because wanting to pay no more than £3 for a tshirt when I can quite easily afford more is nothing less than greed). Buying Fairtrade goods is easier than ever these days. It might be a bit more expensive, but if we don’t do it when we can, we are effectively the same as the landowners of James’ day, failing to pay adequate wages to those who work for us. I don’t know about you, but I found that quite convicting. 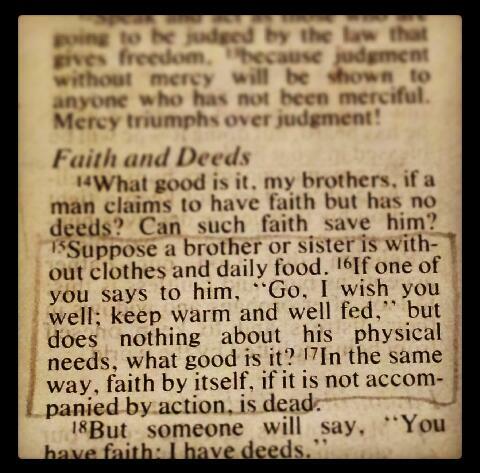 I hadn’t noticed until recently that the Bible tends to command us to take care of our ‘brothers and sisters’ (ie other Christians) before providing general relief to the poor. I find that an interesting challenge. Firstly, I think I have always thought that the role of the church was to make society better – we want people to come to know Jesus; they won’t accept our claims to have found the truth unless they see our transformed lives; one key way to demonstrate the transforming power of God is to get involved in caring for the poor and seeking justice; therefore we should be out on the streets demonstrating God’s power and love to those we meet. I still think that is right, but perhaps the emphasis James and others put on caring for those in our family reflects the fact that in some ways it is easier to go out to the streets and ‘do good’ publicly, and in short bursts than it is to walk the long, slow road of unemployment, drug rehabilitation, loneliness or illness with those you see day after day, week after week. Serving at my local Foodbank once a month is fun and fulfilling – I know I am providing something valuable to the individuals and families who come through the door, and it is building a good reputation for the church and for God in that community. The people with complex financial, physical and emotional needs who are part of my church, though – those I find more difficult and, to my shame, I tend to keep my distance. And the fact that there are at best a tiny handful of people in my church that fit that description is a sad reflection that I am not alone. I’m feeling convicted by this today…I hope it lasts, and turns into a transformed attitude. 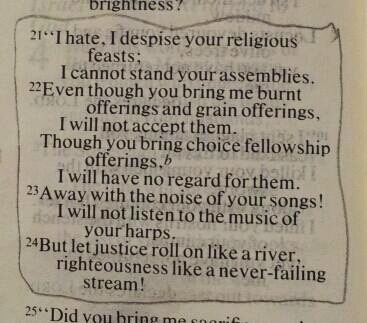 It’s hard to find anything to learn or take on board personally from some of these minor prophets. This verse (and the few following it) seems to be a pretty universal principle, though: you should not rejoice in the misfortunes – or even the just punishments – of others. It goes on to say, “As you have done it will be done to you” (v15). 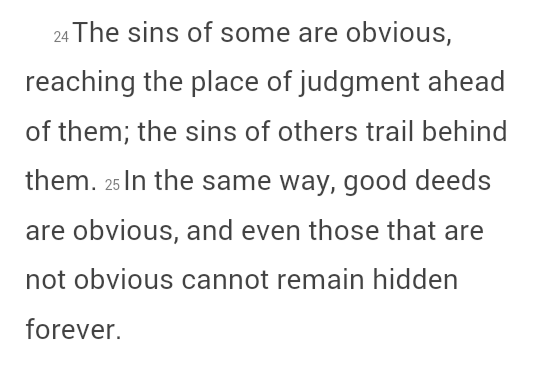 This covers both the things Edom actively did, and the things it failed to do, its attitudes as well as its actions. We are as responsible for the attitudes of our hearts as for the injustices we commit or the acts of mercy we fail to do. What a challenging thought! God had commanded his people to hold these religious feasts and to bring him burned offerings, so how can he say he despises them? It’s because they had become actions of the body, not outpourings of the heart. They were going through the motions, keeping up with the rituals, but, as it says somewhere else ‘their hearts are far from me’. I would look that verse up, but I’ve just spent ages looking for an article I read recently that was worth linking to, and I really need to get on with my day! The article was this one. I can’t remember who I got it from, but it talks about the ‘Clapham Sect’ (most famous for being the group that campaigned successfully for the abolition of the slave trade), and how their Christianity was characterised by both ‘personal spiritual formation’ and social activism. It’s not something we do to earn God’s favour, as the spiritual festivals mentioned in Amos were, or something we do separate from or as an alternative to meeting together in church, but as an outpouring of our faith. Justice and righteousness can only flow out of us if we’re intimately connected to their source, and that intimate connection will naturally – perhaps inevitably – lead to acts of justice and righteousness, because as James put it: faith without works is dead. 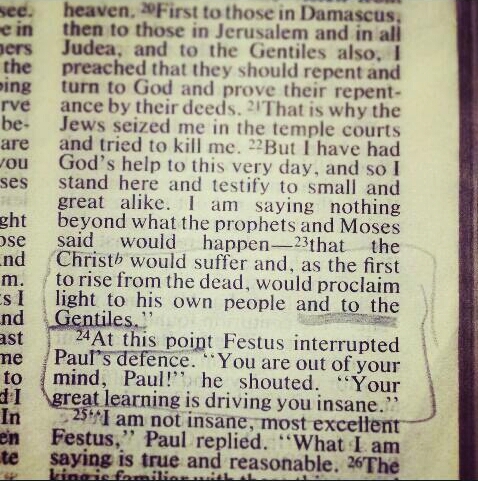 It often seems to be mention of preaching to the Gentiles that gets Paul’s opponents really worked up. He claims that Jesus is the Messiah – no reaction; that Jesus rose from the dead – no reaction; that he, Paul, saw a vision of Jesus on the road to Damascus, was blinded and was later miraculously healed – no reaction; that he had stopped persecuting the Christians and instead joined them – no reaction; that he was now taking this message to Jews and Gentiles alike – uproar, outrage, you must be mad! What is the parallel for us today? I can’t think of any groups of people that the church might find it outrageous for us to take the gospel to. We might find it hard to welcome some types of people into our churches because they challenge our church culture, our preconceptions and our ways of doing things, but we wouldn’t rise up in revolt against those who preached the gospel to them. Maybe that’s a reflection of the fact that we don’t see ourselves as special any more. The Jews understood themselves to be God’s chosen people. They had held a unique and privileged place in his heart and his plan for the world, and still thought they were going to be victorious and rule the whole world some day. The fulfilment of God’s plan, in their eyes, was the overthrow of the Gentiles, presumably involving a total extermination of everyone not born a Jew. I’ve got some ideas of what those concepts might be, but are there any you have come across? I’d love to hear what you think. 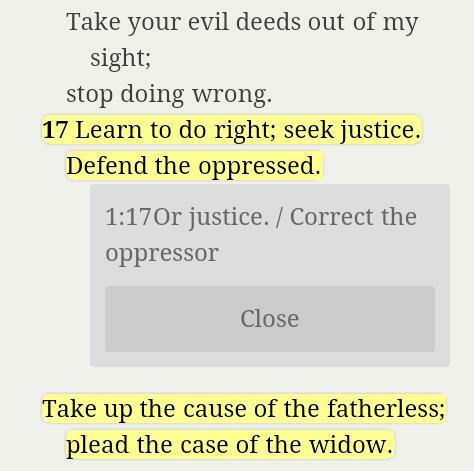 Still on the theme of justice, here’s another verse that stood out to me. In a way it seems more active than some verses – or perhaps more proactive. ‘Act justly’ is one thing, but ‘seek justice’ requires a bit more work – it’s not only about making just decisions in your normal daily life, but going out to find and bring about justice. I liked the word ‘learn’, too. We’re not expected to be perfect immediately, it’s a process, and that’s ok.
I’d highlighted it in my Bible before, but hadn’t really noticed the emphasis on rights. I don’t tend to think of ‘human rights’ as a particularly biblical concept – we don’t have rights, other than the right, won by Jesus’ blood, to be called sons and daughters of God. Everything we have is a gift, lavished on us by the grace of God. We are beneficiaries of unmerited, undeserved favour, not subjects with inalienable rights that we can demand, or even expect. Yet it seems I’m wrong: the poor and destitute at least have rights. I suppose these are the rights they were granted under the Mosaic Law – I think I’d always read those as obligations of people in power, rather than rights of people in need. I know, you’re asking yourself now ‘how are those two things not inseparable?’ – and I’m sort of asking myself the same, now. Maybe it’s because I think of people ‘demanding their rights’ as being just that – demanding. It sounds grasping and selfish (not least because it has got so twisted in recent years with people demanding rights that actually restrict the freedoms of others, and because the emphasis seems to be on pandering to the most strident cries rather than fostering Ann attitude of carrying for one another and seeking each other’s best, each other’s flourishing). So this is really a pondering – is there a difference between the command to ‘defend the poor and the needy’ and the command to ‘defend the rights of the poor and the needy’? Does the latter, perhaps put the poor and needy in a stronger position in our eyes? Maybe it takes us away from seeing ourselves as laudable benefactors and creates a greater sense of equality between ‘us’ and ‘them’. I’ve been asked to think and pray a bit about justice over the next few days, so you may see that theme cropping up here a bit. 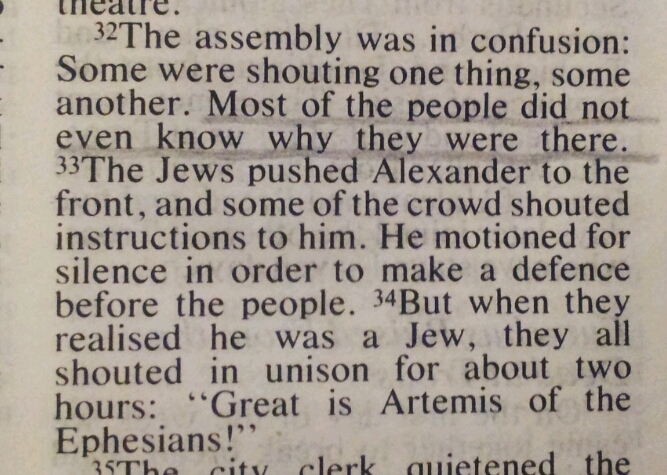 It’s not hard to find examples of the judicial systems of the ancient world cropping up in Acts, anyway. Today’s is another in a long line of tales about people who held authority or, perhaps more significantly, power in a city being outraged when Paul and others come in and start talking about a new way of doing things. They rightly understood that if this Jesus was who the apostles said he was, and really did have the power and authority they claimed, an honest response to him would require rethinking all their traditions and practices. A world in which God was God, not all their manmade gods, would look very different from the world they knew and loved. It seems nothing much has changed in 2000 years, though. The few who really understood what was at stake challenged it through the judicial system, but made sure they whipped up public opinion to be on their side first. 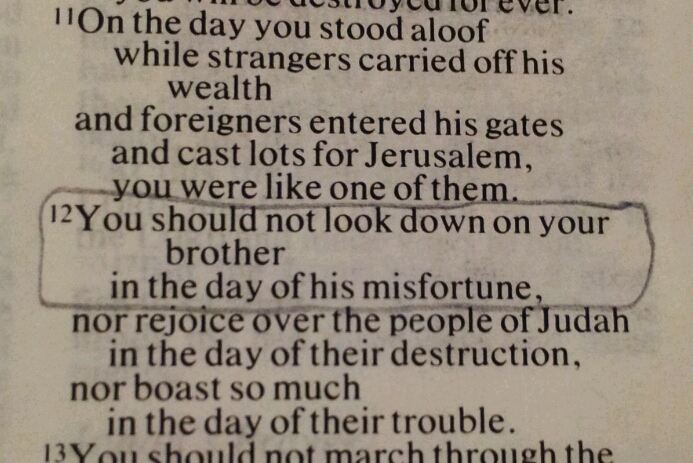 Isn’t this verse telling? There was almost a riot, but most of the people had no idea what they were rioting about. 2) Don’t assume that your opponents have done the same. The tide of public opinion may be strong, but chances are most people won’t know what they’re protesting about – and as we know from the crucifixion story, a crowd shouting ‘Hosanna!’ one day can be screaming ‘Crucify him!’ the next. The tide of public opinion can shift in a moment, and if it can shift one way, it can shift the other. Justice means holding to the truth, not being swayed by the crowd.